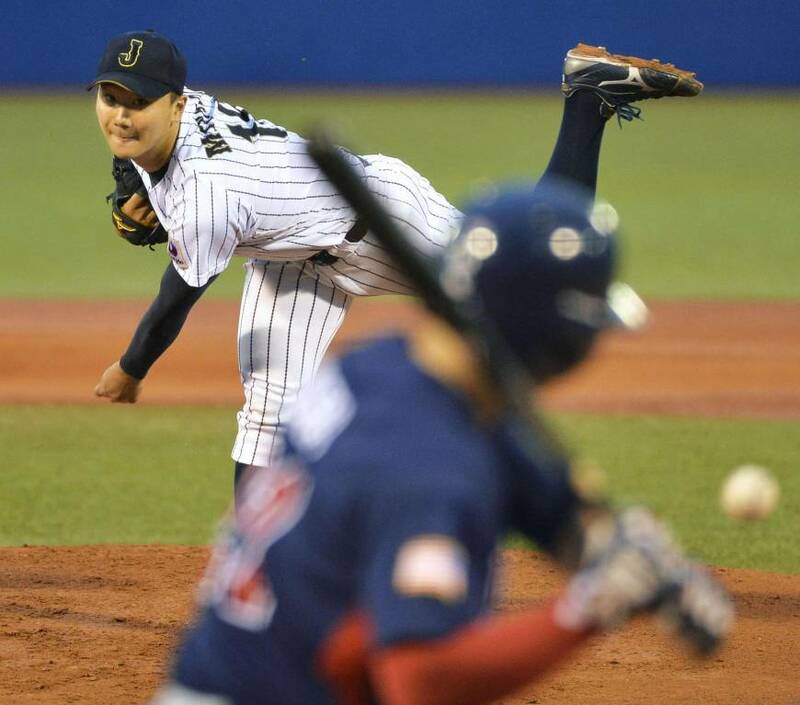 Samurai Japan collegiate squad falls to U.S.
Samurai Japan Collegiate National Team starter Kohei Miyadai fires a pitch during Friday night's game against the USA Baseball Collegiate National Team at Jingu Stadium. The U.S. squad beat Japan 1-0 in Game 3 of their best-of-five series. Kohei Miyadai has helped pull off some improbable wins for the University of Tokyo on the mound at Jingu Stadium this year. He traded in his Todai colors for the Hinomaru on Friday, but fell just short of being part of another magic moment. U.S. outfielder Jeren Kendall drove in the only run of the game and Japan’s Naoki Yoshikawa’s long drive to center ended up as an out instead of a game-tying or sayonara hit, as the USA Baseball Collegiate National Team beat the Samurai Japan Collegiate National Team 1-0 on Friday night at Jingu Stadium. The Japanese lead the five-game series between the two nations 2-1. Miyadai, who was dazzling at times for the long-suffering University of Tokyo baseball team this year was charged with the loss after allowing one run over 3 2/3 innings. “I was given the starting role, but didn’t get the job done, so I’m disappointed,” Miyadai said. He struggled with his command early, walking the first batter of the game on four pitches. He settled down later, getting good movement on his fastball and beginning to miss bats with his off-speed pitches. He left the game with two outs in the third and was charged with one run on three hits. He struck out five and walked two. Japan won the first two games of the series, which took place at Hard Off Eco Stadium in Niigata, winning 2-1 in the first game and 1-0 in Game 2. Game 4 is scheduled to take place on Saturday in Shizuoka. This year marks the 40th time collegiate squads from the two nations have met in this series. Japan won the inaugural series in 1972, winning five of seven games, but the Americans hold a 22-17 edge overall. Kendall hit an RBI double in the second to account for the Americans’ only run of the game. Friedl reached base four times, with a walk, bunt single, single and double. Starter Brendan McKay and Alex Lange each threw four scoreless innings for the U.S. and Tyler Johnson pitched around a walk and a double to close out the game in the ninth. Lange earned the win. The Americans allowed just three hits, including a pair of doubles to Takuya Sato, and had to protect a one-run advantage from the second inning on. “Brendan gave us a good start, and we were trying to extend to make it a little bit easier on our pitching staff,” Horton said. “He passed the baton to Alex, and Alex was tremendous. He’s a good fastball-curveball guy, and got some good mileage out of his changeup tonight. I thought he was effective in the zone and effective out of the zone, and that’s called good pitching.